Published: Dec. 1, 2015 at 12:32 a.m. Updated: Dec. 1, 2015 at 02:10 p.m.
One quarterback clocked one of the five fastest times among four speedy wide receivers in Week 12. See who it was, and more in this week's Next Gen stats. 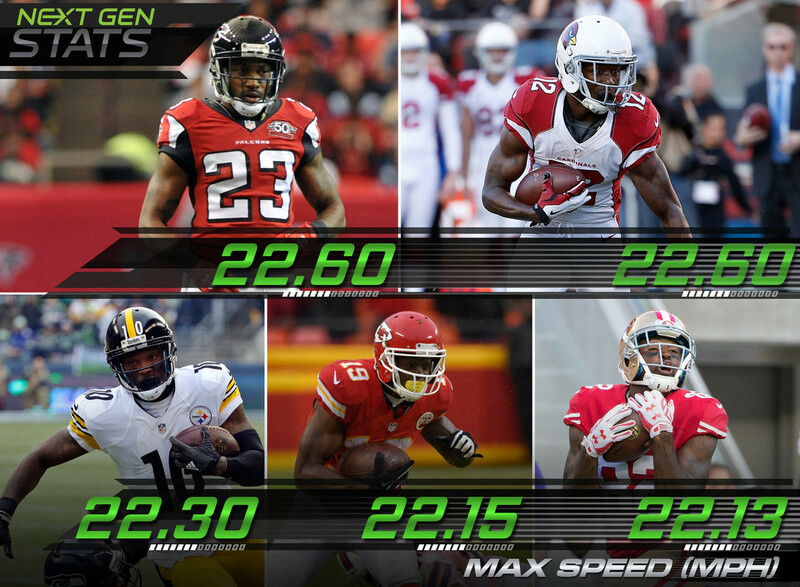 One cornerback and four wide receivers hold the fastest speeds through 12 weeks: Atlanta Falcons cornerback Robert Alford (22.60 mph), Arizona Cardinals wide receiver John Brown (22.60 mph), Pittsburgh Steelers wide receiver Martavis Bryant (22.30 mph), Kansas City Chiefs wide receiver Jeremy Maclin (22.15 mph), and San Francisco 49ers wide receiver Torrey Smith (22.13 mph). Four wide receivers and one quarterback recorded the fastest speeds on their way to the end zone in Week 12: Washington Redskins wide receiver DeSean Jackson (21.38 mph), Kansas City Chiefs wide receiver Jeremy Maclin (20.45 mph), Seattle Seahawks wide receiver Doug Baldwin (20.35 mph), Pittsburgh Steelers wide receiver Markus Wheaton (19.86 mph), and Arizona Cardinals quarterback Carson Palmer (18.88 mph). Luke Kuechly (18.37 mph) and Kurt Coleman (18.02) each took an errant Tony Romo pass to the house for a pick six and recorded the fastest and 3rd-fastest speeds on interception returns this week. Fumble aside, Eddie Lacy continued his late season comeback in reaching 100 rushing yards for the second straight game. He averaged 2.72 yards run per rushing yard gained, his most efficient downhill game of the season. Over the past two games he has run 3.56 yards per rushing yard gained, compared to 4.58 before Week 11. Teddy Bridgewater continues to have the happiest feet in the pocket this season. He entered Week 12 averaging 13.84 yards run per drop back, highest in the league. Against the Falcons he averaged 14.86 and had under 200 yards passing for the 4th time in 5 games. Despite his age, Matt Hasselbeck showed he can still move around in the pocket and make plays. He moved an average 13.51 yards per drop back on 12 completions of 10+ yards against Tampa Bay. Chris Ivory's bruising 31-yard 4th-quarter touchdown run iced the game for the Jets. Ivory reached a max speed of 18.76 mph, which was the 4th-fastest on a rushing touchdown on the day. He covered just 6.73 yards from the snap before making contact with his first would-be tackler, Neville Hewitt, behind the line of scrimmage and absorbed contact from four more Dolphins defenders over the next 12 yards run before busting free to the end zone. C.J. Anderson had his best game of the season, including the game-winning touchdown run in overtime. He was decisive in his runs, needing just 2.88 yards of distance per rushing yard gained well above his season average of 4.44 entering the week. Anderson topped 18.00 mph on both touchdown runs, something he hadn't done since Week 8. Blaine Gabbert has posted a top-2 ball carrier speed among quarterbacks in each of the three games he has played. He owns 4 of the top 5 over the last four weeks and 5 of the top 10. He was on bye in Week 10. Brock Osweiler's mobility continues to utilize his mobility in stark contrast to Peyton Manning. Though his 10.85 average distance per drop back was lower than the league average of 11.19, he completed passes of 11, 20 and 22 yards on dropbacks of 12 yards or more after completing four passes for 75 yards on drop backs of 20+ yards the week before.